… Am I the only one that got a pony sent to them? *Only other bloggers are gonna know what that means… unless, of course, I was the only one that got a pony and in that case no one will know what I mean. Oh well. Thought I would ask. Kids these days… Under $95 on Amazon. You may remember that I reviewed the Center Mass Laser for you a while back on this here gun blog… The Loadout Room has a nice review posted up now that you should go check out. Compare and contrast as you so desire. Not too long ago I had a package show up here at the Gunmart Blog Test Kitchen from the good people over at Laserlyte. Inside of said package was their latest and greatest training aid… The Reaction Tyme Trainer Targets. I kid you not… Cold Steel Tactical Baseball Bat?? Wha? Ok… well, I guess there is that. Cold Steel President Lynn Thompson asked his team to create an indestructible bat. 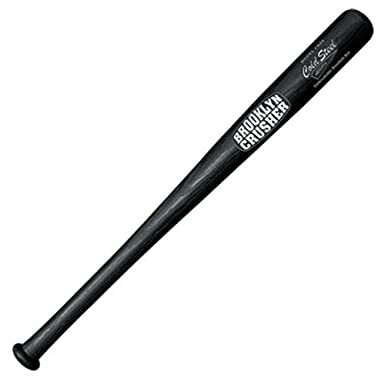 The result was the Brooklyn Crusher, a synthetic polypropylene bat that will never break, rot, crack, splinter, or fade. Smasher can be used as a competition bat, for batting practice, and even at-home self defense. You might remember the write up that I did on the SafeGuard Armor Stealth Concealable Body Armor a while back. Its a great product and I was very happy with it all the way around… Black Sheep Warrior has a write up posted up now on the very safe product that you should definately go give a look. *Also goes to show you the level of customer service in the sporting goods section. heh.